King David's Tomb (Hebrew: קבר דוד המלך‎) is a site considered by some to be the burial place of David, King of Israel, according to a tradition beginning in the 12th century. The majority of historians and archaeologists do not consider the site to be the actual resting place of King David. It is located on Mount Zion in Jerusalem, near the early 20th century Abbey of the Dormition. The tomb is thought to be situated in a ground floor corner of the remains of the former Hagia Zion, considered a Byzantine church or late Roman era Synagogue. The building is now administered by the Diaspora Yeshiva, a Jewish seminary group. Due to Israeli Jews being unable to reach holy sites in Jerusalem’s old city during the Jordanian occupation, the tomb of David became a place of worship, sought for its views of the Temple Mount, and thus became a symbol of prayer and yearning . Formerly a mosque, it was converted into a synagogue following the establishment of the State of Israel in 1948; from then onwards, the Israeli Ministry of Religious Affairs began the process of turning the site into Israel's primary religious site. Jewish prayer was established at the site, and Jewish religious symbols were added. From 1948 until the Six-Day War in 1967, it was considered the holiest Jewish site in Israel. The tomb compound includes the location traditionally identified as the Cenacle of Jesus, the original meeting place of the Christian faith. Recent years have seen rising tensions between Jewish activists and Christian worshippers at the site. The tomb is located in a corner of a room situated on the ground floor remains of the former Hagia Zion an ancient house of worship; the upper floor of the same building has traditionally been viewed as the Cenacle of Jesus. The site of David's burial is unknown, though the Tanakh locates it southwards, in the Ir David near Siloam. In the 4th century CE, he and his father Jesse were believed to be buried in Bethlehem. The idea he was entombed on what was later called Mt Zion dates to the 9th century CE. Writing around 1173 Benjamin of Tudela recounted a colourful story that two Jewish workers employed to dig a tunnel came across David's original splendid palace, replete with gold crown and scepter and decided the site must be his tomb. The Gothic cenotaph preserved to this day was constructed by the Crusaders: the Mount Zion conquered by David according to the Book of Samuel was wrongly ascribed by medieval pilgrims to this site, and David was presumed to be buried there. In 1332 the Franciscans, the officials representatives of the Roman Catholic church in the Holy Places, moved their headquarters to the Cenacle, having acquired it in 1332 from Sultan An-Nasir Muhammad for 30,000 ducats. According to Dominican pilgrim Felix Fabri, in 1429 Mamluk Sultan Barsbay took part of the lower floor of the complex away from the Franciscans and converted the tomb chamber into a mosque. Though it was returned a year later, possession alternated back and forth until 1524 when Ottoman Sultan Sulayman (Suleiman the Magnificent) expelled the Franciscans from the entire complex. The resulting Islamic shrine was entrusted to Sufi Sheikh Ahmad Dajani and his posterity. 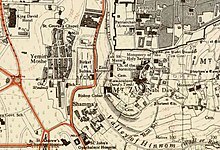 The Franciscan Monastery in Jerusalem during the 16th century did not encompass today's King David Tomb complex. In fact it was not a monastery but the residence of a small band of friars—in a room on the Western part of today's David Tomb because it was thought to be the site of the Last Supper. The friars used to throw their rubbish outside on the Eastern side of today's Tomb complex. The Sharif Ahmad Dajani, the first to hold the Dajani name, cleaned up the waste and constructed the neglected Eastern side of today's King David Tomb complex—where the tomb is located—in the 1490s. He established a place for Muslim prayer on the Eastern part of today's complex. In 1552 the Franciscans were ejected from the Cenacle, on account of alarm caused by a rumour that some Christian workmen had discovered the Tombs of David and Solomon and the other Kings of Judah. The "Ibn Dawood" mosque, a title given Sheikh Ahmad Dajani by the residents of Jerusalem, was established for Muslim prayers under the patronage of Sultan Suleiman the Magnificent and the supervision of al-Shareef Sheikh Ahmad bin Ali Dajani. Management of the site was transferred to the Muslim Palestinian family al-Ashraf Dajani al-Daoudi family (descendants of the Prophet Mohammad's grandson Hussein) by an edict from Sultan Suleiman the Magnificent in 1529. Since then, the Dajani family supervised and maintained this site. As a result, they were given the title of Dahoudi or Dawoodi by the residents of Jerusalem in reference to the King David Tomb complex. During the British Mandate period, the site was not subject to the Status quo of Holy Land sites since it was considered to be "absolutely under the authority of the Moslem Waqf of Nebi Daud, who however arrange to open it to the many that are anxious to visit a site of such sacred traditions". Mount Zion district in 1946. After the 1948 Arab–Israeli War, the southern part of Mount Zion upon which the Tomb stands ended up on the Israel side of the Green Line. Between 1948 and 1967 the eastern part of the Old City was occupied by Jordan, which barred entry to Jews even for the purpose of praying at Jewish holy sites. Jewish pilgrims from around the country and the world went to David's Tomb and climbed to the rooftop to pray. Since 1949, a blue cloth, with basic modernist ornamentation, has been placed over the sarcophagus. The images on the cloth include several crown-shaped Rimmon placed over Torah scrolls, and a violin, and the cloth also features several pieces of text written in Hebrew. The building is now part of the Diaspora yeshiva. Since the establishment of the State of Israel, no architectural, religious or other changes have been made in the Coenaculum room, where the Nabi Daoud is situated, and access thereto is accorded to all visitors in strict accordance with the status quo. No applications by Moslems to visit the place has been refused. In December 2012, unknown persons completely destroyed a large number of 17th-century Islamic tiles in the tomb; the Israel Antiquities Authority has decided not to reconstruct them. The contents of the sarcophagus have not yet been subjected to any scientific analysis, to determine their age, former appearance, or even whether there is actually still a corpse there. The authenticity of the site has been challenged on several grounds. According to the Bible, David was actually buried within the City of David together with his forefathers; by contrast, the 4th century Pilgrim of Bordeaux reports that he discovered David to be buried in Bethlehem, in a vault that also contained the tombs of Ezekiel, Jesse, Solomon, Job, and Asaph, with those names carved into the tomb walls. The genuine David's Tomb is unlikely to contain any furnishings of value; according to the 1st-century writer Josephus, Herod the Great tried to loot the tomb of David, but discovered that someone else had already done so before him. The 4th-century accounts of the Bordeaux Pilgrim, Optatus of Milevus, and Epiphanius of Salamis all record that seven synagogues had once stood on Mount Zion. By 333 CE (the end of the Roman Period and beginning of the Byzantine Period) only one of them remained, but no association with David's tomb is mentioned. According to the Book of Samuel, Mount Zion was the site of the Jebusite fortress called the "stronghold of Zion" that was conquered by King David, becoming his palace and the City of David. It is mentioned in the Book of Isaiah (60:14), the Book of Psalms, and the first book of the Maccabees (c. 2nd century BCE). After the conquest of the Jebusite city, the hill of the Lower City was divided into several parts. The highest part, in the north, became the site of Solomon's Temple. Based on archaeological excavations revealing sections of the First Temple city wall,[where?] this is believed to have been the true Mount Zion. Towards the end of the First Temple period, the city expanded westward. Just before the Roman conquest of Jerusalem and the destruction of the Second Temple, Josephus described Mount Zion as a hill across the valley to the west. Thus, the western hill extending south of the Old City came to be known as Mount Zion, and this has been the case ever since. It must however be said that Josephus never used the name "Mount Zion" in any of his writings, but described the "Citadel" of king David as being situated on the higher and longer hill, thus pointing at the Western Hill as what the Bible calls Mount Zion. At the end of the Roman period, a synagogue called Hagiya Zion[dubious – discuss] was built at the entrance of the structure known as David's Tomb probably based on the belief that David brought the Ark of the Covenant here from Beit Shemesh and Kiryat Ye'arim before the construction of the Temple. Others disagree. "Hagia Sion" (Holy Zion) was the Greek Christian name for the basilica built on the grounds in the late fourth century CE. What some scholars contend is that "David's Tomb" was actually once a late Roman synagogue. The identification of David's Tomb as a synagogue has been thoroughly challenged due to the absence of typical synagogal architectural characteristics including (original) columns, benches, or similar accoutrements. The presence of a niche in the original foundation walls, thought by a few to be evidence of a Torah niche, has been refuted by many scholars as being too large and too high (8' x 8') to have served this purpose. Although the sources for the tradition of David's Tomb on Mount Zion are not clear, it appears that it only began to take root during the subsequent, early Muslim period. Apparently, the Christians inherited this belief from the Muslims, and only at a relatively late juncture in the city’s history were the Jews finally convinced as well. Others disagree. The facility was under the control of Greek Christians at this time. It was, indeed, shortly before the Crusades at the earliest that the location of David's Tomb can be traced to Mount Zion. But the first literary reference to the tomb being on Mount Zion can be found in tenth-century Vita Constantini (Life of Constantine). And Ora Limor attributes the localizing of the tomb on Mount Zion to the desire of Roman/Latin Christians to infuse the spirit of the "founding fathers" into the site by imaginatively connecting it with the supposed tombs of David and Solomon. 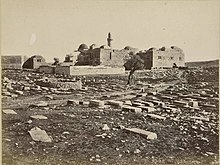 Having initially revered David's tomb in Bethlehem, Muslims began to venerate it on Mount Zion instead but no earlier than the 10th century following the Christian (and possibly Jewish) lead. In the twelfth century, Jewish pilgrim Benjamin of Tudela recounted a somewhat fanciful tale of workmen accidentally discovering the tomb of David on Mount Zion. Epiphanius' 4th-century account in his Weights and Measures is one of the first to associate the location with the original meeting place of the Christian faith, writing that there stood "the church of God, which was small, where the disciples, when they had returned after the Savior had ascended from the Mount of Olives, went to the upper room". Archaeologists, doubting the Mount Zion location and favouring the biblical account, have since the early 20th century sought the actual tomb in the City of David area. In 1913, Raymond Weill found eight elaborate tombs at the south of the City of David, which archaeologists have subsequently interpreted as strong candidates for the burial locations of the former kings of the city; Hershel Shanks, for example, argues that the most ornate of these (officially labelled T1) is precisely where one would expect to find the burial site mentioned in the Bible. In the mid-nineteenth century, engineer and amateur archaeologist Ermete Pierotti reported discovering a cavern beneath the grounds of the Byzantine and Crusader churches on Mount Zion which he suspected extended to beneath the Tomb of David. A limited exploration revealed human remains within a huge vault supported by piers. The cavern has yet to be confirmed or scientifically excavated. Wikimedia Commons has media related to David's Tomb. Vincent, Louis-Hugues (1922). "III: La Sainte Sion et les sanctuaires de second ordre a l'intérieur de la ville". Jérusalem. Recherches de topographie, d'archéologie et d'histoire. 2. Gabalda. pp. 421–668. Bar, Doron (2004). "Re-creating Jewish Sanctity in Jerusalem: Mount Zion and David's Tomb, 1948–67". Journal of Israeli History. 23 (2): 260–278. doi:10.1080/1353104042000282401. Cust, L. G. A. (1929). The Status Quo in the Holy Places. H.M.S.O. for the High Commissioner of the Government of Palestine. Silvio Ferrari; Andrea Benzo (15 April 2016). Between Cultural Diversity and Common Heritage: Legal and Religious Perspectives on the Sacred Places of the Mediterranean. Taylor & Francis. pp. 150–. ISBN 978-1-317-17502-5. Breger, Marshall J.; Reiter, Yitzhak; Hammer, Leonard (2009). Holy Places in the Israeli-Palestinian Conflict: Confrontation and Co-existence. Routledge. pp. 105–. ISBN 978-1-135-26811-4. Peled, Alisa Rubin (February 2012). Debating Islam in the Jewish State: The Development of Policy Toward Islamic Institutions in Israel. SUNY Press. ISBN 978-0-7914-9006-8. Reiter, Yitzhak (7 April 2017). Contested Holy Places in Israel–Palestine: Sharing and Conflict Resolution. Taylor & Francis. pp. 186–. ISBN 978-1-351-99885-7. Mizrachi, Yonathan; Veeder, Anna (2014). David's Tomb on Mt. Zion (PDF). Emek Shaveh. Wharton, Annabel Jane (2013). "Jerusalem's Zions" (PDF). Material Religion. 9 (2): 218–243. doi:10.2752/175183413X13703410896050. Limor, Ora (1988). "The Origins of a Tradition: King David's Tomb on Mount Zion". Traditio. 44: 453–462. doi:10.1017/S0362152900007133. ^ Breger, Reiter & Hammer 2009, p. 105: "Director General Kahana was obliged to contend with the problematic nature of the Tomb's status. Immediately after the war he initiated a long series of religious ceremonies that brought about a radical change in the status of King David's Tomb and served to encourage Jewish control of the Tomb structure, in the absence of any official decision by the State of Israel. This endeavor was roundly condemned by various official Israeli bodies from its earliest stages." ^ Breger, Reiter & Hammer 2009, p. 106: "Particularly vexing was the matter of the status and definition of King David's Tomb, an issue that was the focus of disagreements and conflicting interests even within the Ministry. 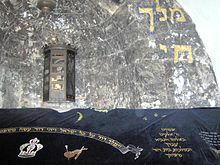 On the one hand, it was Kahana himself who initiated extensive Jewish prayer activity at the site, with the goal of eradicating the Muslim past of King David's Tomb. He saw to the placement of numerous Jewish symbols in and around the Tomb, aimed at demonstrating the political-religious change that had taken place at the site and impressing this fact upon visitors. with the concurrence of the Ministry's architectural advisor, Meir Ben Uri, the phrase "David King of Israel Lives and Endures" was painted over the niche above the tombstone, while large oil-burning candelabra were hung nearby." ^ Doron Bar, “Holocaust Commemoration in Israel During the 1950s: The Ho- locaust Cellar on Mount Zion,” Jewish Social Studies: History, Culture, Society n.s. 12, no. 1 (Fall 2005): 16–38"The development of Mount Zion and David’s Tomb as the holiest site in the State of Israel occurred immediately after the end of the 1948 war, when pilgrims frequented the previously inaccessible tomb...Still, it seems that the main reason for the cellar’s decline in popularity was the geopolitical change that followed the Six Day War of 1967. The outcome of the war and the reclamation of the Jewish holy places in the Old City of Jerusalem resulted in the steady decline in the status of David’s Tomb and the Holocaust Cellar"
^ a b c Rabbi Dr. Ari Zivotofsky, 'Where is King David Really Buried?,' The Jewish Press, May 15th 2014. ^ Cust 1929, Chapter The Status Quo : its Origin and History till the Present Time section B quote: "in A.D. 1230, the Franciscan Order was established in Jerusalem and became the official representatives of Roman Catholicism in the Holy Places, with their headquarters in the Cenacle on Mount Zion, obtained from the Egyptian Sultan, Melek-el-Nasr, in 1332, for 30,000 ducats". English version, page 303: "The Jews have many times begged the Soldan to give them that place, that they may make an oratory of it, and they beg it of him even to this day : while the Christians have always refused it to them. So at last the Soldan inquired wherefore this place was holy. When he was told that David and the other kings of Jerusalem of his seed were buried there, he said : 'We Saracens also count David holy, even as the Christians and the Jews do, and we believe the Bible as they do. Wherefore neither the Christians nor the Jews shall have that place, but we will take it for ourselves. He thereupon came to Jerusalem and blocked up the door by which one entered that chapel from inside the monastery, desecrated the chapel, turned out Christ's altars, brake the carved images, blotted out the paintings, and fitted it for the worship of the most abominable Mahomet, making a door on the outside by which the Saracens could enter it when they pleased." ^ Pringle, Denys (2007). The Churches of the Crusader Kingdom of Jerusalem: A Corpus. Vol. 3. The City of Jerusalem. Cambridge University Press. p. 270. ^ Pringle 2007, p. 271. ^ Cust 1929, Chapter The Status Quo : its Origin and History till the Present Time section B : "The result was that in 1552 by Imperial decree the Franciscans were ejected from the Cenacle, which passed into Moslem hands. 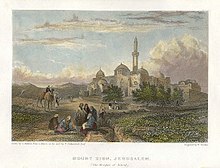 [Footnote: According to some authorities this drastic action of the Sultan was on account of the alarm caused by a rumour, started originally at the end of the 12th century by Rabbi Benjamin of Tudela, that some Christian workmen had discovered on Mount Zion the Tombs of David and Solomon and the other Kings of Judah.]". ^ Limor, Ora (Jan 1, 2007). "Sharing Sacred Space" in edited book In Laudem Hierosolymitani. Ashgate Publishing, Ltd. p. 227. ISBN 9780754661405. ^ Feldinger, Lauren Gelfond (8 July 2013). "Israel and Vatican close to signing Holy Land accord". The Art Newspaper. ^ "Dajani Daoudi Family Website". ^ Cust 1929, Chapter The Status Quo : its Origin and History till the Present Time section C quote: "The Cenacle is not a subject of concern to this study, being absolutely under the authority of the Moslem Waqf of Nebi Daud, who however arrange to open it to the many that are anxious to visit a site of such sacred traditions.". ^ a b c Peled 2012, p. 93. ^ Islam: Political Impact, 1908-1972 : British Documentary Sources. 9. Archive Editions. 2004. p. 59. ISBN 978-1-84097-070-8. ^ a b Peled 2012, p. 94. ^ Nir Hasson (August 3, 2013). "Who is 'Judaizing' King David's Tomb?". Haaretz. ^ Bordeaux Pilgrim, Itinerarium Burdigalense 20; Optatus of Milevus, Contra Donatistas 3.2; Epiphanius of Salamis, De Mensuris et Ponderibus 14 (54c). ^ a b c d Bargil Pixner (2010). Rainer Riesner (ed.). Paths of the Messiah. Keith Myrick, Miriam Randall (trans.). Ignatius Press. pp. 320–322. ISBN 978-0-89870-865-3. ^ Jacob Pinkerfeld, "'David's Tomb': Notes on the History of the Building: Preliminary Report," in Bulletin of the Louis Rabinowitz Fund for the Exploration of Ancient Synagogues 3, ed. 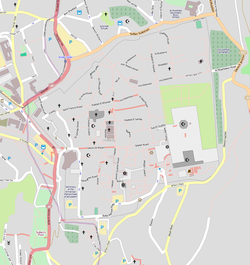 Michael Avi-Yonah, Jerusalem: Hebrew University, pp. 41-43. ^ Clausen, David (2016). The Upper Room and Tomb of David: The History, Art and Archaeology of the Cenacle on Mount Zion. Jefferson, NC: McFarland. pp. 168–175. ISBN 9781476663050. ^ Jerome Murphy-O'Connor, The Holy Land: An Oxford Archaeological Guide From Earliest Times to 1700, 5th ed. (New York: Oxford University Press, 2008), 117; Oskar Skarsaune, In the Shadow of the Temple: Jewish Influences on Early Christianity (Downers Grove, IL: InterVarsity Press, 2002), 189; Joan Taylor, Christians and the Holy Places: The Myth of Jewish-Christian Origins (Oxford: Clarendon Press, 1993), 215; Clausen, 158-163. ^ Doron Bar (2004). "Re-creating Jewish Sanctity in Jerusalem: Mount Zion and David's Tomb, 1948–67". The Journal of Israeli History. 23 (2): 260–278. ^ Pixner, Paths 352; Clausen, Upper Room 57. ^ Anonymous, Vita Constantini 11. ^ Ora Limor, "The Origins of a Tradition: King David's Tomb on Mount Zion," Traditio 44 (1988): 459. ^ Benjamin of Tudela, Masa'ot Binyamin 85. ^ Kathleen Kenyon, Archaeology in the Holy Land (1985), p. 333. ^ a b Hershel Shanks, Biblical Archaeology Review, January/February 1995, p. 64. ^ Ermete Pierotti, Jerusalem Explored: Being a Description of the Ancient and Modern City, 2 vols., trans. Thomas George Bonney (Cambridge: C. J. Clay, 1864), 215. This page was last edited on 23 April 2019, at 09:32 (UTC).